If you are using Windows x64 and are a Firefox user, you may want to check out Cyberfox instead. 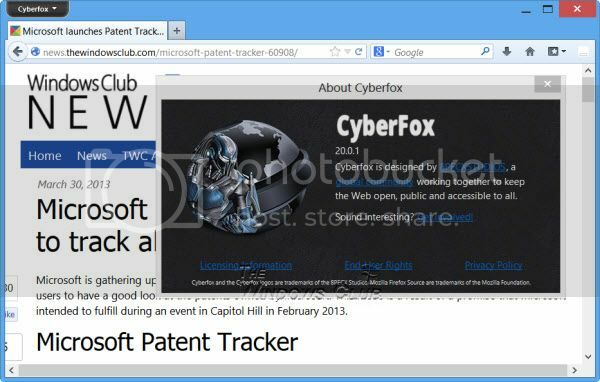 Cyberfox is a x64 bit web browser which is compiled with Microsoft Visual Studio, Windows 8 SDK & Intel Composer XE 2013, and based on the Firefox code. Its developer claims that Cyberfox is faster than most other browsers and definitely faster than Firefox. Cyberfox, like Waterfox and Pale Moon, is compatible with Windows Vista x64, Windows 7 x64, Windows 8 x64 and you can download it here. If you use Firefox on a 64 bit system then yes Cyberfox x64 will definitely a step up. Reason being is that Firefox is a 32 bit browser, although it works on 64 bit systems you never get the full potential and speed out of it, reason being is that a 64 bit browser will allow you to take full advantage of your 64 bit system resources, but as with a 32 bit Firefox, it will start to slow down and crash after it gets to around 2 gigs. Now, 2gigs may sound like a lot to most but for those of us that keep a lot of web pages open and do a lot of downloading and other system chores,you can reach that 2 gig limit real fast. So yes, if you have a 64 bit system, a 64 bit browser such a Cyberfox would be the way to go. BTW - For all those Firefox fans using a 64 bit system ..... Firefox does not make a 64 bit browser nor do they ever plan to, other than the nightly builds which are falling by the way side, Firefox will never do a 64 bit browser and they are really kind of arrogant about it in their forums. Their stance is that the 32 bit version of Firefox runs "good enough" on a 64 bit system that they do not need to do a 64 bit build. With that kind of attitude, they won't be around too much longer, if you can't or won't build a 64 bit browser when the computing world is pretty much 64 bit dominated these days, your gonna be left in the dust ...... Hence, Cyberfox, Waterfox, Pale Moon, all support x64, all built on the Mozilla code, so then, why can't Firefox do it? MrMBerman and HappyAndyK like this. How to Hide this x86 shame of FireFox?? why can't they just make a good x64 version for the 64bit machines, which is the future ? Note from Moderator: i shortened the quote above. There is no need to quote the whole post. Last edited by hackerman1; 2nd May 2016 at 11:10.